There are no news at present relating to this time period / topic. You can follow @tipifoam on Twitter at https://twitter.com/tipifoam; Hashtag #tipifoam. Organic-Research.net provides access to some key initiatives on organic farming research world-wide and also serves as the website of TIPI, the Technology Innovation Platform of IFOAM - Organics International. 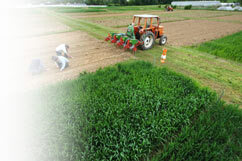 Organic-Research.net is maintained by the Research Institute of Organic Agriculture (FiBL). On February 16, 2018, the sixth Science Day took place at BIOFACH, the World Organic Trade Fair, in Nuremberg, Germany. It was a joint event of TIPI, the Technology Innovation Platform of IFOAM and TP Organics, the European Technology Platform for Organic Food and Farming. Report from the pre-conference and the Organic World Congress (OWC), that took place 08 – 11 November 2017 in New Dehli, India. Effect of freezing on Quality of organically grown apples. Neri, L.; Santarelli, V.; Di Mattia, C.; Sacchetti, G.; Faieta, M.; Mastrocola, D. and Pittia, P. (2019) Effect of Dipping and Vacuum Impregnation Pretreatments on the Quality of Frozen Apples: A Comparative Study on Organic and Conventional Fruits. Jounal of Food Science, 84 (4), pp. 798-806. Witten, Stephanie; Ritteser, Carolin; Grashorn, Michael and Aulrich, Karen (2019) Anwendung einer in vitro Multienzymmethode zur Schätzung der praecaecalen Rohprotein- und Aminosäurenverdaulichkeit bei Broilern. [Application of an in vitro multi-enzyme assay to estimate the precaecal digestibility of crude protein and amino acids in broiler chicken.] In: Proceedings of the Society of Nutrition Physiology, DLG-Verlag, Frankfurt, 28, p. 91.